Follow along in our journey and watch as we use our talents to bring hope and change the world. On Sunday, December 11th the Humble Project Team partnered up with Beacon for Him to provide a special holiday celebration to 5 local families. The families were blessed with makeovers provided by a team of Barbers and Stylists onsite, different activities for the kids to enjoy, Santa Claus on site to celebrate with the children, a photographer on site to take family portraits, amazing live music, gifts and a catered dinner. A special thank you to all of our donors and volunteers who helped make this event possible including Suavecito, Target, Walmart, and Costco. We teamed up with 7th Street Church and Gems Uncovered on Thanksgiving morning to pass out hot meals and a care package to those in need along the 710 freeway riverbed and local parks. We are thankful to everyone who donated their time and treasure. All efforts were appreciated by our team and more importantly the people we were serving! 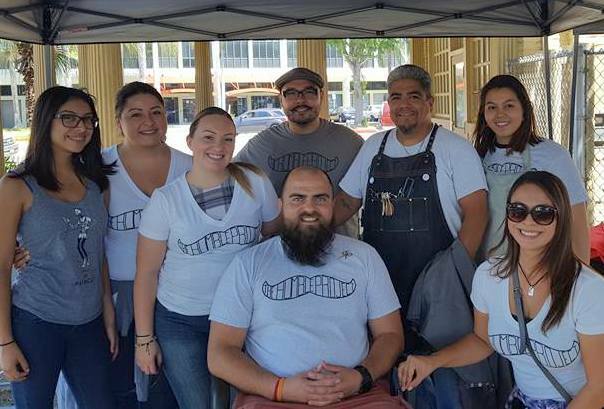 The Humble Project Team and volunteers came out and provided free haircuts and care packages to those in need at Martin Luther King Jr. Park in Long Beach. Volunteers also assisted in a community garden clean up and harvest giveaway. The team participated in Lynwood’s Homeless Count Day. Haircut and care packages were provided to those in attendance. Our amazing team of volunteers were able to bless twenty Covenant House Residents. A group of Barbers, Stylists, Makeup Artists and Nail Technicians provided a day of pampering, while other volunteers took them off site for an amazing shopping experience made possible with donations and funds raised. The residents were also able to enjoy a catered dinner, Spoken Word and a Motivational Speaker.